Ned: D-what? [bumps into a tree] Oof! Homer: I'm outside? Where'd inside go? [the shadow comes over him] WAAAH! Homer: [worried panting, finger comes down] Aah! [panting continues, finger comes back down] Hup! Homer: Wah! Why are you doing this to me? "Giant" Homer: Because, if I tap you ten times in this game, I get free donuts. "Normal" Homer: [slightly sadly] Are you saying I'm not real? I'm just a character in a game, [happily] and there are free donuts?! "Normal" Homer: Let's do this, giant me! 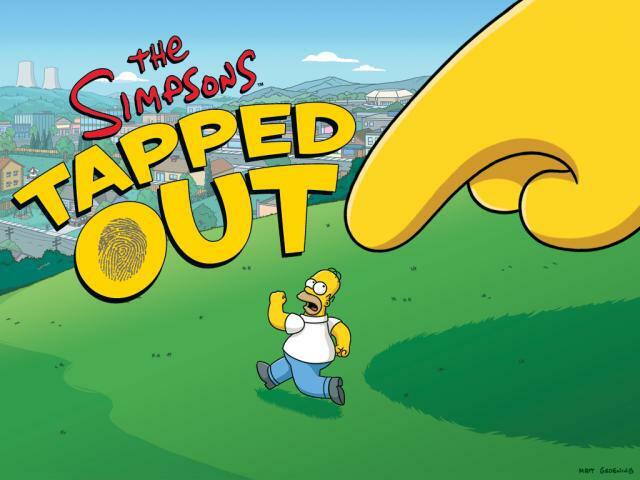 Squeaky-voiced teen: Download The Simpsons: Tapped Out for free, and tap Homer ten times in a row, and in addition to the in-game donuts, you'll receive a special bonus decoration! "Normal" Homer: Heh heh heh heh! Heh heh heh! Heh heh heh heh heh heh heh heh heh! "Giant" Homer: This game is life ruiningly fun! Narrator: The scariest thing to happen to your phone since your mom learned to text! Narrator: Team up with Homer to build the Springfield of your dreams. Narrator: Because doesn't that sound more fun than whatever you've got going on in the real-world? Modified on February 25, 2015, at 08:58.